SPIRU-TEIN is scientifically formulated with isolated soy protein from only non-genetically modified (non GMO) soybeans- As Nature Intended. Add one heaping scoop (scoop included in can) of Double Fudge Crunch Spiru-Tein Powder to 8 fl. oz. of skim milk, whole milk, or juice, and mix (or shake) until smooth. For best results, milk or juice should be very cold. Contains puffed soy crisps. For best results: Gently stir, do not use a blender. 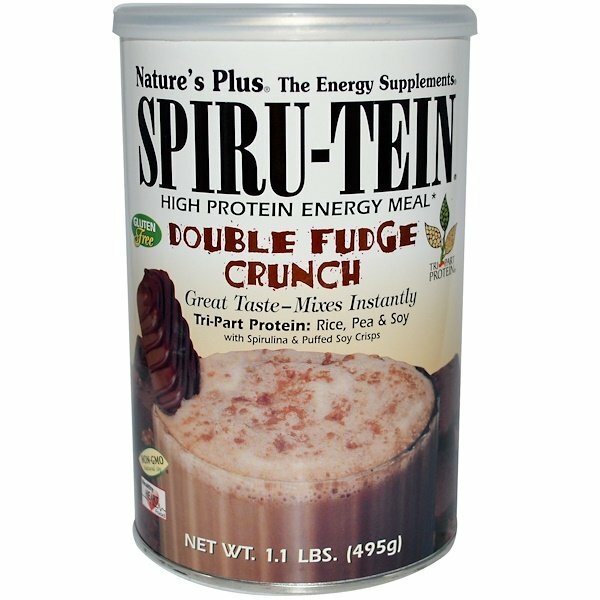 Double Fudge Crunch Spiru-Tein mixes instantly-no blender required. 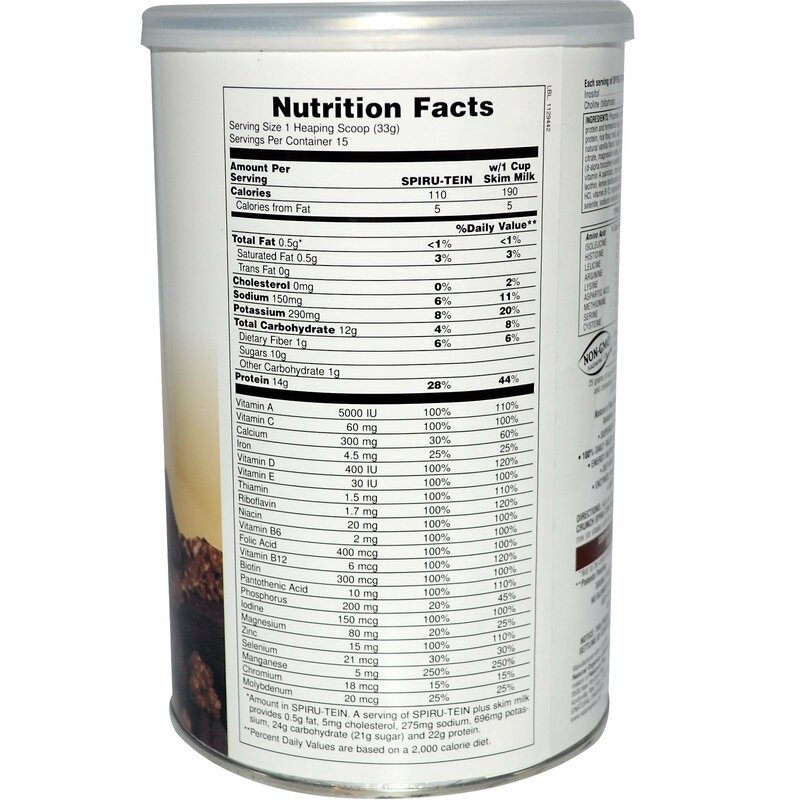 Proprietary non-GMO protein blend (rice protein, pea protein, soy [isolated soy protein and fermented soy]), fructose, Dutch cocoa, puffed soy crisps (non-GMO isolated soy protein, rice flour, malt, salt), di-calcium phosphate, fructooligosaccharides (FOS), xanthan gum, natural vanilla flavor, natural chocolate flavor, guar gum, psyllium, maltodextrin, potassium citrate, magnesium oxide, oat bran, microcrystalline cellulose, spirulina, vitamin C, vitamin E acetate, choline bitartrate, inositol, apple pectin, bee pollen, niacinamide, vitamin A palmitate, zinc oxide, manganese sulfate, ferrous fumarate, calcium pantothenate, lecithin, lemon bioflavonoids, papaya, bromelain, chlorophyll, pyridoxine HCl, riboflavin, thiamine HCl, vitamin B-12, ergocalciferol, folic acid, biotin, potassium iodide, chromium chloride, sodium selenite, sodium molybdate...and love. 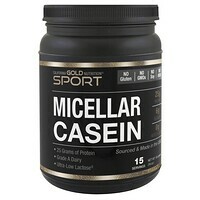 Not to be used as the sole source of dietary calories. * Amount in SPIRU-TEIN. A serving of SPIRU-TEIN plus skim milk provides 0.5 g fat, 5 mg cholesterol, 275 mg sodium, 696 mg potassium, 24 g carbohydrate (21 g sugar) and 22 g protein.